Welcome to Henbogle. 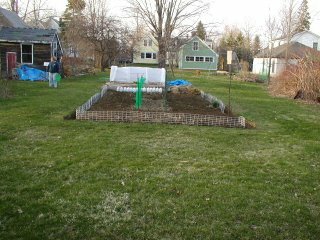 I'll share spouse Dan's and my experiences as rural Maine homeowners, dedicated DIYer's and gardeners (add cooking for me). 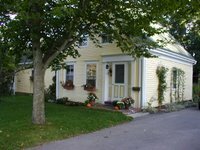 We love small-town living, and have been fixing up our 1881 Cape since we bought it in December, 2000. Our latest complication -- we are experimenting with chicken raising... we've ordered 6 Hubbard's Golden Comet chicks, which will be arriving in a few weeks! Then there are the eggs, the chickens, the cats, the slugs, the squash bugs, and our grand plan for chickens as rototillers -- with the girls' help, our garden will grow by 150 square feet this summer, and be pre-fertilized. And the cats should find the chickens vastly entertaining, we MUST keep our catly responsibilities in mind! Still, there was the deciding factor.... end of life care. I am pretty sure I could not actually bring myself to kill the chickens -- or help Dan do it for that matter. I'm hoping the girls will be almost pets with more benefits than the dog (not hard). The local farm supply store cinched the deal when they told us about a nearby business -- you bring them the chicken, you come back later to collect the chicken, neatly packaged in butcher's paper. We do intend to keep our girls for as long as we can -- how long remains to be seen. Of course, the girls will need a hen house. When planning our chicken coop, I soon realized we needed to hold ourselves in check after Dan and I debated for 20 minutes on the merits of finding some remnant vinyl flooring to put in the coop! Then there's the antique dayight window we will use, providing ambience, lighting, and ventilation. It eventually dawned on us that we were planning a chicken castle, thus our decision to name the coop Henbogle after the Scottish estate "Glenbogle" featured on the BBC series Monarch of the Glen, which we're currently watching thanks to NetFlix.